The Doubledays' playoff run ended Thursday night against the Renegades after a season filled with fun and exciting baseball. A close game all the way until the late innings, Auburn was unable to come away with the win and fell to Hudson Valley, 7-3. 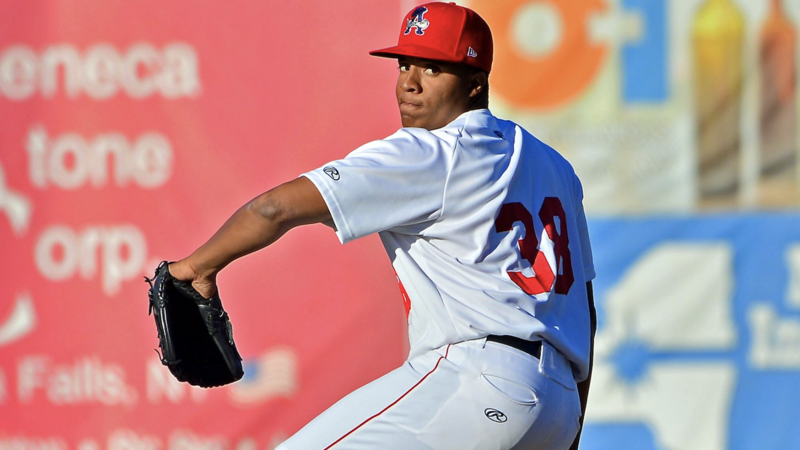 Francys Peguero had one of his better starts for the Doubledays this season. Coming in with a regular season ERA of 2.93, "El Pegui" flashed some extra deception on his pitches to set a season-high in strikeouts with seven while going only four innings. But while he was on his A-game, he was not able to replicate his last stellar outing when he threw a one-hitter through five innings. He allowed two earned runs, the first of which was the first run of the game in the second inning. The Renegades were able to load up the bases on three singles but were only able to come away with one run on a groundout. "El Pegui" struck out the next batter to end the inning and leave runners on at second and third. The Doubledays bounced back nicely after Peguero got himself out of his jam. Auburn scored twice in the top of the third in what would become the first of several back-and-forth innings. Pablo O'Connor was able to score Ricardo Mendez from third base while also advancing Jose Sanchez to third on a groundout. Jacob Rhinesmith then knocked in Sanchez after reaching on a fielding error by the centerfielder, but was unable to score after a flyout ended the inning. Hudson Valley evened the game at 2-2 in the bottom half and retook the lead two innings later off of new pitcher, Chandler Day. Day - who hadn't allowed an earned run in his past three outings and had a 1.13 ERA over his past 24 innings - threw a wild pitch to bring in the run and allowed two more runs to score in the eighth. His three-run outing was the first time he had allowed more than one run since July 18. The Renegades' two-spot in the sixth certainly dampened the Doubledays' momentum after tying the game at 3-3 in the top of the inning. Rhinesmith - who led off the game with a single and proceeded to swipe second base - advanced to third on a groundout and scored on a Kyle Marinconz single. Rhinesmith's run was unfortunately the last for the Doubledays, as the Renegades went on to score two more times to give Hudson Valley their 7-3 win and advance to the New-York Penn League finals against the Tri-City ValleyCats. The Doubledays end their 2018 season with tonight's loss. Make sure to follow the Doubledays on Facebook (@OfficialAuburnDoubledays), Instagram (auburndoubledays), and Twitter (@doubledays) for updates during the offseason.